I've been enjoying coconut lately (as you can see from my coconut milk ice cream! ), and I came up with this yummy application the other day. I hardly eat fruit at all in the winter since everything is out of season but apples and pears, so when summer comes around I like to have a little fun. 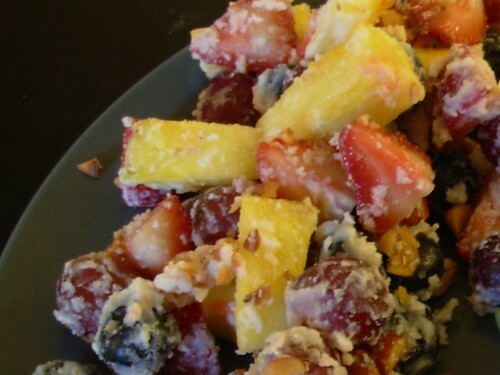 I've used a specialty ingredient in this fruit salad, which is coconut butter. It's just like any other nut butter in that it's the whole nut ground up into a paste. The kind I get is Artisana raw coconut butter, which is ground at low temperatures and supposedly retains all the coconutness of the coconut (you know, enzymes, vitamins, fiber, etc). I don't even know if any other companies make coconut butter. Anyway, if you can't find this stuff, I would substitute some unsweetened shredded coconut and maybe a few tablespoons of coconut milk (or even better, if you get the kind of coconut milk that separates in the can into a thick cream and a runny liquid, use only the thick cream). I don't really find most sweet dessert type things appealing anymore (especially pastry - blech), but I still have a soft spot for ice cream. I just love the stuff. There is a brand of ice cream I can find at Whole Foods that's made with coconut milk instead of dairy or soy, but the sweetener is agave syrup, which I won't eat due to the extremely high fructose content and heavy processing it undergoes. So now that the weather has been hot I have been making little ice cream treats at home. Last week I made some strawberry ice cream using this recipe from Elana's Pantry but subbing raw honey for agave. It was very nice. 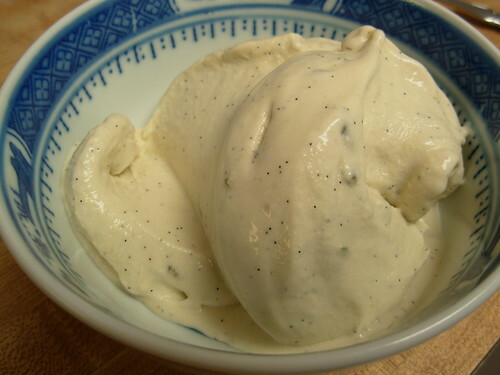 This week though, I got some lavender from my CSA and I decided to make a honey lavender ice cream. Forget "very nice," this stuff is AWESOME. And it's completely dairy and agave free! I've used a custard base for it, so it's a little more complicated to make than Elana's recipe, but the result is decadent. The base of this paleo ice cream would be very nice even without the lavender and could serve as a jumping off point for other mix-ins/flavorings. Set up a double boiler by placing a heat proof bowl over a pot of simmering water (be sure it's simmering and not a full rolling boil, as this will give you better control later). Add the coconut milk and lavender to the bowl. Scrape the insides of the vanilla bean into the coconut milk, then throw in the whole bean pod as well. Stirring fairly frequently, heat until the coconut milk is hot but not boiling. Remove the vanilla bean pods. Once the custard is cool enough for you to stick your finger in it and hold it there without burning, whisk in the raw honey. Put the custard base in the refrigerator or freezer until it gets cold. Freeze in your ice cream machine per the manufacturer's instructions. One of the nice things about blogging on my own schedule is that I can wait until I have something good to show you before posting about it. Since I'm not posting on my on schedule with this One Local Summer thing, this week you get to see some of my blah food. I guess it doesn't look too bad, but it was just meh. We had green onion burgers made with ground beef from Smith Meadows Farms, lots of green onions from our CSA and held together with an egg from our CSA. On the side was a little slaw made with kohlrabi and basil from our CSA and a touch of extra virgin olive oil and vinegar. 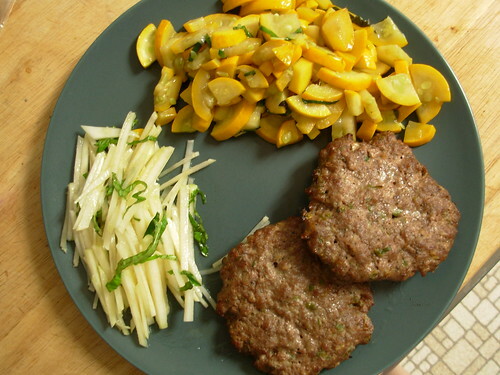 We also had some lovely golden zucchini from Red Rake Farm with some more CSA basil, sauteed up with a little lard that I rendered from Polyface pork fat. Nothing was bad exactly, but there is nothing here I would make again. 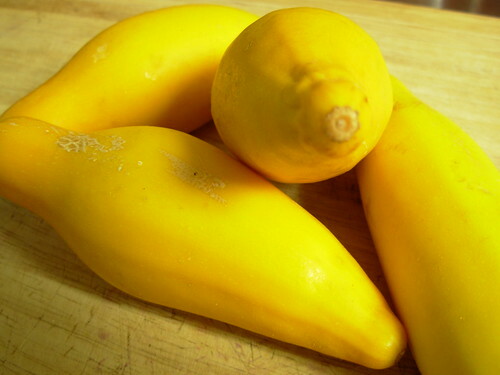 The golden zucchini I got from Red Rake Farm were so pretty. The guy told me that the day before they had been about an inch or two long and they literally quadrupled in size overnight! I hope he has some more next week so that I can find something yummier to do with them. :) In the mean time, check out what other Southern folks are getting up to this summer at last week's roundup. This week for One Local Summer I had a near miss that turned into a delicious hit! I love making great tasting food that's from local producers and also healthy and paleo - gluten and dairy free. The star of dinner tonight was a roasted chicken from Polyface Farms. I rinsed and dried the chicken and then generously salted and peppered it inside and out. The outside I wrapped in bacon from EcoFriendly Foods and the inside I stuffed with two of the season's first peaches from Westmoreland Berry Farm. Into the oven at 425 for 30 minutes, then I reduced the heat to 350 and roasted it for an additional hour. The plan was to end up with delicious bacon-wrapped chicken and some roasty peach chunks. My oven had other plans! Now, I've made bacon wrapped chicken before and it's always turned out, but this time for some reason the bacon shriveled to itty bitty bacon cinders and became inedible. So not only did I have burned bacon, but I had flabby chicken skin. Erg. 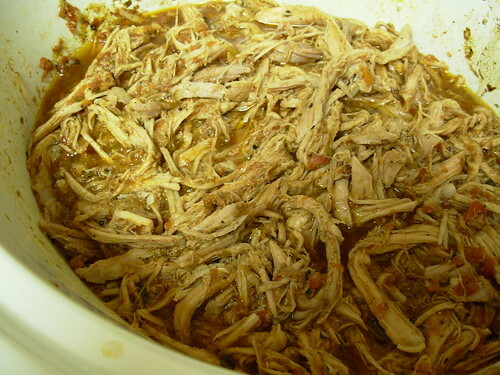 I removed the peaches from the chicken and noticed they were not roasty at all either. My plans had been foiled, but I thought there had to be some way to salvage this food. After a moment's pondering I set the bacon cinders aside and carved the chicken into two leg quarters, two breasts, and two wings. I put the chicken pieces on a foil lined baking sheet and put them back in the oven to turn the flabby skin crispy. What to do with the peaches...aha! Gravy! To get our leafy greens in for the day I made some braised kale from Pleasant Fields Farm. First I sauteed some baby onions from our CSA in the chicken/bacon drippings, then added the kale and a little water, covered, and let it braise for about 15 minutes. 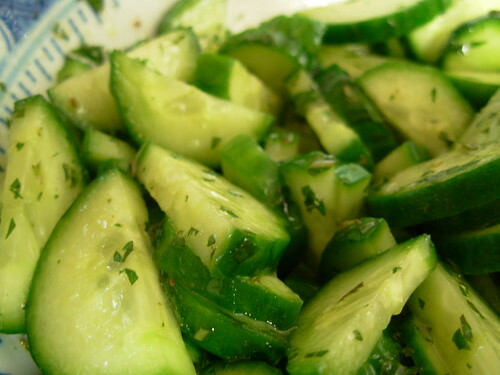 To add some freshness to the meal, I made a quick cucumber salad using crispy little Persian cucumbers from Toigo Orchards. They are so snappy and delicious! I tossed them with some chopped orange mint from Red Rake Farm, a drizzle of extra virgin olive oil, and a splash of rice vinegar. 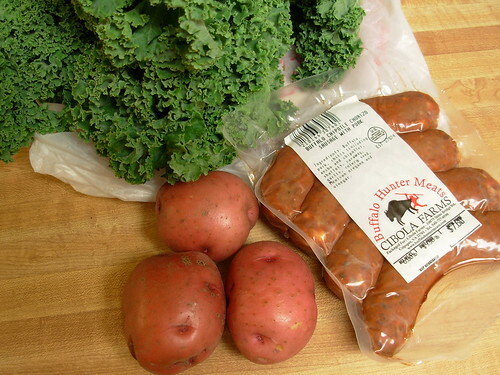 Red Rake Farm is one of my favorite stands at the Arlington Farmer's Market. It's all organic and their produce looks more "real" to me than some of the other places for some reason. And the owner, Peter, is always ready with a smile and story. Much nicer than shopping at a grocery store! Once the veggies were ready, the chicken skin was crispy and the peaches were nice and broken down for the gravy, and dinner was served! 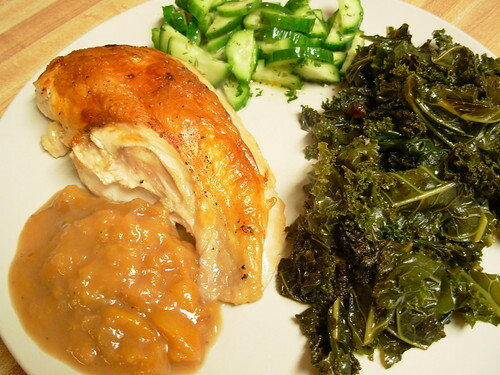 I think everything tied together very nicely - the crispy chicken skin with the sweet warm peach gravy, the tender kale, and the cool fresh cucumbers. My husband even ate the bacon cinders and said they kind of tasted like pork rinds. Success! Back in April I signed up for the One Local Summer event over at Farm to Philly. I thought it would be a neat way to challenge myself to really use more local and seasonal ingredients in my cooking. I'm excited to see what northern Virginia has in store for me this summer! We were pretty busy this weekend, so my first local meal was a pretty basic brunch we had on Saturday morning before heading off for the day. 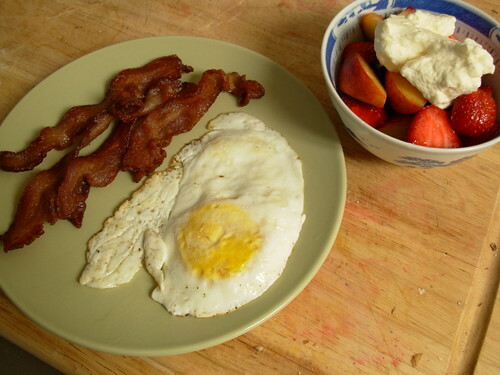 We had bacon, eggs, and fruit salad with whipped cream. The bacon I picked up at the farmer's market from a kind of local farm aggregate called EcoFriendly Foods. It comes from pastured pigs and is cured with just salt and sugar. It was definitely the best local bacon I've had so far, but not quite as good as the local bacon we used to get when we lived in New Jersey from Cherry Grove Farm. The eggs were from Joel Salatin's famous and fabulous Polyface Farm. I joined their buying club a few months ago. Every month I place an order with them and pick it up from one of their northern Virginia drop off spots. I cooked the delicious dark yolked eggs in some of the fat left over from cooking the bacon. The fruit salad was strawberries from Toigo Orchards and some not-so-local peaches (they came from Georgia via Whole Foods). I would have left the peaches out happily, but they were in my fruit basket and going bad, so into the salad they went. To top our fruit I whipped a little heavy cream from J-Wen Farm. Selling raw milk is illegal in Virginia unless you go through a cow sharing program, but the stuff from J-Wen is not homogenized and is just pasteurized rather than ultrapasteurized. The fruit was so naturally sweet that the whipped cream didn't require any sugar. I don't eat very much dairy at all, but I just had a hankering this weekend so I picked the cream up at the farmer's market.